US Australia meth bust estimated $1.29 billion. Police are warning the seizure of a record-breaking $1.29 billion ice haul in the United States is a sign that “powerful and violent” Mexican drug cartels are focusing their trade on Australia. The estimated $1.29 billion of ice is the largest-ever seizure of the drug in the United States and the largest-ever seizure of meth bound for Australia. They have been charged with various offences, including importation and possession of commercial quantities of illicit drugs. The AFP said the bust related to 25 kilograms of ice discovered in a car in country Victoria last year, which led police to a drug house where two tonnes of drug-related chemicals were found. “The suspect was linked to organised crime, outlaw motorcycle gangs,” Assistant Commissioner Bruce Hill said. He said they worked with their US counterparts, and traced the consignment to California on January 9. They uncovered 1.7 tonnes of ice, 25kg of cocaine and 5kg of heroin hidden in 800 electrical capacitors in two containers destined for Melbourne. “This is the largest seizure of ice bound for Australia ever, I [especially] note this is the largest seizure of ice ever located in the USA,” Assistant Commissioner Hill said. Assistant Commissioner Hill said the attempted importation marked a dangerous turning point for Australia. “This is a serious warning, we now believe the Mexican cartels are actively targeting Australia,” he said. “They’ve been sending smaller amounts over the years, this is now flagging the intent Australia is now being targeted. Victoria Police officers yesterday conducted simultaneous raids in six suburbs across Melbourne and executed three search warrants in New South Wales. 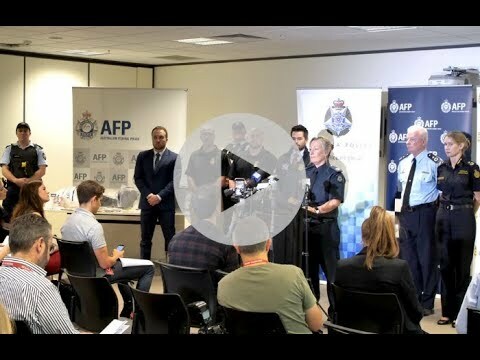 “We executed 10 search warrants in Woodstock, Pakenham, Derrimut, Campbellfield, Keilor Downs and Epping and in New South Wales we conducted three search warrants in Bonnyrigg Heights, Mount Pritchard and Hinchinbrook,” Victoria Police Assistant Commissioner Tess Walsh said. A 52-year-old American man, a 46-year-old American woman based in Woodstock, a 31-year-old man, and 29-year-old woman of Keilor Downs were charged. They were due to face the Melbourne Magistrates’ Court today. Victoria Police planned to extradite two men, aged 25 and 31, from New South Wales who were allegedly involved with the US-based crime syndicate under investigation over the shipment.